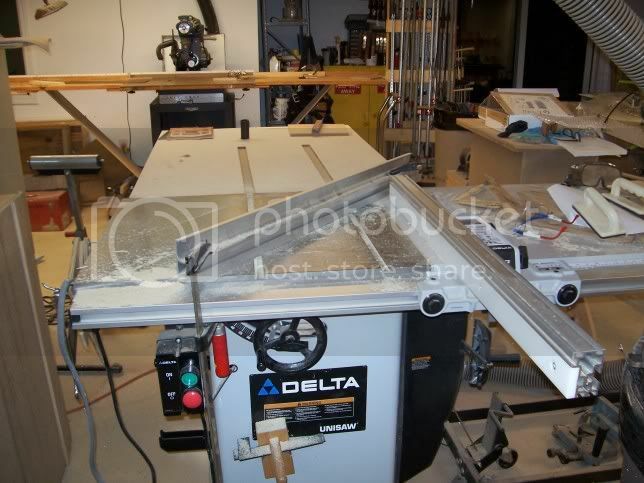 I am looking for a jig to guide boards through a tablesaw to make coves. I have sketched up a jig that will attach to a tablesaw fence and guide pieces at angles up to just over 45 degrees. The fence is on the far right. The 12 inch wide by 14.5 inch long board is to position the jig away from the fence for clearance of the adjuster. The 12 X 14.5 board will actually be attached to the fence. Does anyone have an idea that they like better than this appoach? That looks like a cool jig however I would put the slotted adjustable arm closer to the front of the fence. That said however, I get good results with just a longer board clamped to the TS table top. I'm with Leon on that. No need for a fancy jig. I use a 6" strip of 3/4" thick corian. Thru trial and error I figured out the angle to get a cove the same radius as the back of a rubber block sander. Scribed a line in the tablesaw top where the fence goes & ground a scraper to match the radius. Now, I just rip to width, cut the double 45s on the edges, clamp on the corian fence on the scribed line, cut the coves, then scrape off the saw marks, give a quick sand, and they're done, ready for finishing. Yep! I saw that. If I find myself doing a lot of them, I would go for that cove cutter. Right now $250-$260 is a little rich for me. The jig I drew just seems kind of fun to do and should only take about 1/2 to 1 hr to make now that I have the thing drawn. I just thought someone might have another idea I liked better. Also, I was wondering if the angle of 45 degrees or so maximum was enough. Tomorrow I can measure the angle scribed on my saw if you like. I think it's more than a 45 though. If you hold a saw blade and look at it from the side, then slowly turn it so the edge is facing you, you'll get an idea of what the profile looks like at various angles. At a full 90, straight into the side of the blade, you get a wide shallow cut - a 10" radius. Assuming a 3/4" thick board, the angle will be determined by the width of the board, since for a typical cove molding you would cut right up to the bevels on the edges, leaving maybe a 1/4" of material at the peak of the radius. A wide cove for crown would be closer to a 90, but a small cove for a cabinet might be closer to a 45. An easy way to eyeball your angle would be to draw the radius you want on the edge of your board, lay it on the saw with the fence removed, set the blade height to match the top of the cut, then sight down the board and the blade, moving the board around the blade till you find the right angle. If you haven't done this before, remember: lots of light passes! Just take off a little at a time. > If you haven't done this before, remember: lots of light passes! Just take > off a little at a time. Saved the most important till last. This one needs to be well thought out before doing anything. The thinking chair will get lots of use for this job. Definately has to be laid out correctly, but it's actually pretty easy to do. Measured the angle scribed on the saw top: 58 1/2 degrees. This gives about a 7" radius for a 4 1/4" workpiece, and makes a nice cove that fits between the edge bevels without making the cove too thin. For a wider workpiece, a greater angle would be needed, for a smaller piece a lesser angle. Of course, the fence goes in front of the blade, and how far forward is determined by where the blade ends up at the finish height; you may find that the saws trunion set-up pushes the blade forward as it's raised. You want to cut the cove just almost up to the bevels - leave a little flat so the piece doesn't "fall into" the blade, so your pieces will be consistent later when you go to miter and cope them. When you scrape off the saw marks, scrape right up to the bevels, then round the points over when you sand. The cove angle could be greater than 45 deg. - just depends on the curve you want. And the 30" fence would be OK unless the workpiece got too long. Also, for cutting deep coves, that end up quite thin at the bottom of the cut, a guide on both sides of the workpiece is recommended to keep the work from spreading under downward pressure, or worse, splitting... http://namgnewsletter.com/dy/pdf_plans/cuttingcove.pdf In any case, the fence(s) should be clamped firmly to the saw table. That is indeed a neat cutter. I did some cove before and I can attest to the labor involved to remove the saw marks... But this cutter made me think. 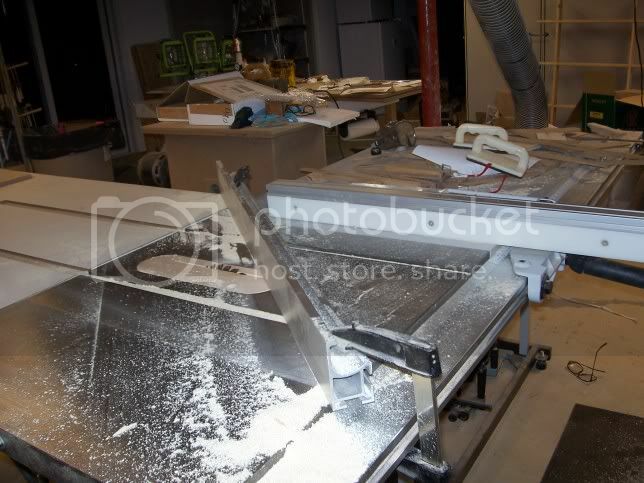 Wouldn't using the same setup instead with a table saw moulding cutterhead with cove tips on it achieve the same? Not to split hairs, but what kind of fence runs perpendicular to the blade insert? I've done this a number of times, and I've never really seen problem with a straight board and a couple of c-clamps. I've always used just a board clamped to the table top at the proper angle. To find my angle I make a little square from scraps screwed together at the corners so it can be squeezed together to form a parallelogram. As you push or pull the sides the distance between the sides changes but they remain parallel. If you want a 1" deep by 3" wide cove, raise the blade to one inch squeeze your jig to 3" wide (inside), lay it on the table top over the blade and turn it until two parallel sides (that are in contact with the top and are 3" apart) touch the front and the back of the blade. That should be your angle. If you know you need 1" of flat material before the cove starts, make your jig from 1" wide scrap and you can mount your fence right against the jig. Remove the jig, roll the blade down and make several passes. When you get the blade back to 1" high you should have the desired width on your cove and the desired amount of flat area on the stock before the cove starts. I tried an experiment cove cutting both pine and white oak using a Forrest WWII going both right and left across a blade tilted at 20 degrees. I did not see much difference and it appeared that going across the blade left to right on a right tilt saw with the 20 degrees of tilt produced a slightly smoother cut. I did not notice any real difference in the force of pushing the work into the blade. Not scientific, but it will take a much better test to detect any real difference. Can anyone give any different experience from tests both ways? Now if I can attach the canted fence to the Unifence somehow, it would be easy to move the canted fence parallel by moving the normal Unifence. That way I could create the same cove on different sides of a rectangular piece of stock without complex repositioning. All I would have to do is move the Unifence, not the angle. Any thoughts of how to best accomplish this from my photos? Woodworking Tools/Supply in Olympia, WA area? Ping Leon - Sawstop problem? Tool Reviews - was Woodworker's Journal: Yea or Nay?